The Unipept web application supports biodiversity and functional analysis of large and complex metaproteome samples. Its underlying index structure is designed to quickly retrieve all occurrences of a tryptic peptide in UniProt entries. Taxon-specificity of the tryptic peptide is successively derived from these occurrences using a novel lowest common ancestor approach that is robust against taxonomic misarrangements, misidentifications and inaccuracies. This application consists of four separate functionalities: the Tryptic Peptide Analysis, the Metaproteomics Analysis, the Unique Peptide Finder and the Peptidome Clustering. 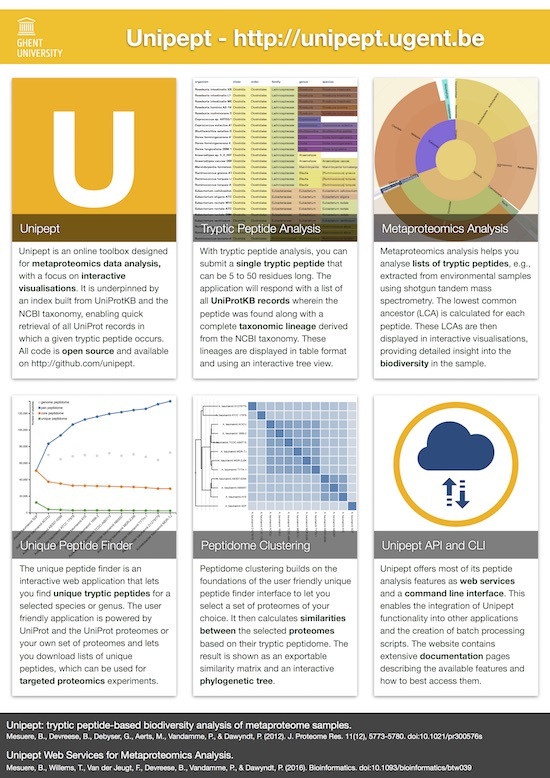 The initial Unipept publication can be found at Unipept: tryptic peptide-based biodiversity analysis of metaproteome samples, a follow up publication can be found at The Unipept Metaproteomics Analysis Pipeline. The API was published as Unipept Web Services for Metaproteomics Analysis. For indivitual contributions, the github contributors page is the most informative. All unipept code is open source and available on github. We make no warranties regarding the correctness of the data, and disclaim liability for damages resulting from its use.